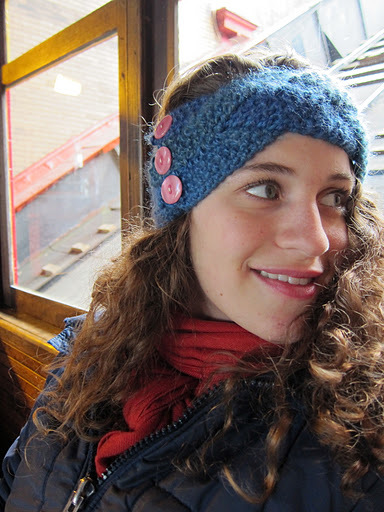 Last year I posted a pattern for a braided winter headband. After making one for myself, my mom and my little sister I soon realized it was the most popular knitted item I’ve ever created. The problem is, I’m really lazy and unless I’m determined, I really hate making these headbands. It’s simple, any beginner knitter could do it, but it takes too long and I lose interest. I decided to try the pattern on larger needles with thicker yarn. Turns out I actually prefer the pattern this way. It goes by much more quickly and the texture stands out more strongly. I’m still pretty lazy and can’t get myself to produce enough to sell, but I thought I might as well post my pattern so I don’t forget how I made it (hence the whole reason I started this blog in the first place). If these instructions aren’t clear enough, you can always look at my other pattern for a slightly different explanation. Using two double point needles, cast on 24 stitches. Knit in seed stich (also called moss stitch) till piece measures 12 inches. I always slip the first stitch of each row to keep the edge even. *Next row: seed stitch the first 8 stitches onto an empty double pointed needle. Work back and forth on this “leg” for 12 inches. Repeat * for each of the two remaining “legs” of the headband. Weave in the first tail of yarn. Braid the three “legs” of the headband till there’s about 2 inches left at the ends. Pin the three ends to the beginning of the piece, creating the headband shape. Make sure the ends overlap the beginning of the piece so there’s a good amount of space for the size of your buttons. Turn headband inside out. With needle and thread, whipstitch parts of the braid so the “legs” are secure and don’t move or twist apart when stretched. I really want to try this.. I dunno if this is a silly question, but after you transfer your first stitches onto a doulbe point needle and finish that, isn’t your yarn at the end of that first leg? How do you then do the other two legs? After I finish the length of the first prong, a decrease the stitches so it makes a slight taper and then I cast off. I go back to the bottom of the prong and pick up and knit the next 8 stitches and go back and forth in seed stitch till it’s the same length as the first prong. I taper and cast off, then go back to the base of the prongs and pick up the last 8 stitches and do the same. It’s not a long project, so I would try getting to that point in the pattern and see if it makes sense. Please let me know if it doesn’t and I’ll try to help you. Thanks for taking a look at my pattern! Wow! thanks for the quick reply. I will definitely give it a try. I’ve been browsing around for some nice headband patterns and i really liked yours! ps- i’ve always wanted to visit alaska! i’m slightly envious you got to grow up there! 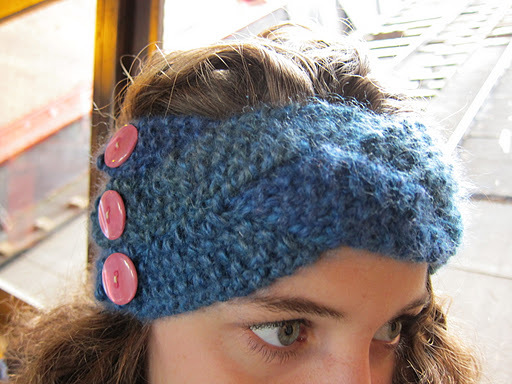 I’m fairly new at knitting but want to make some headbands. This sounds crazy but what is the seed stitch? Seed stitch, or moss stitch, is the simplest of decorative stitches. You knit 1 stitch and purl 1 stitch across the row. On the next row, you’ll do the opposite, you’ll purl 1 stitch and knit 1 stitch. This will create a bumpy texture that lies flat. It’s hard to see if you’re a beginner, but you want to knit where you purled on the previous row and purl where you knit. I recommend doing a YouTube search and I’m sure you can find a visual tutorial. Good luck! I would like to make this for a 6 year old granddaughter. Could you suggest an adjustment in size? Thank you for any help you might give me. I would suggest knitting with one strand of yarn and using smaller needles, such as size 7. 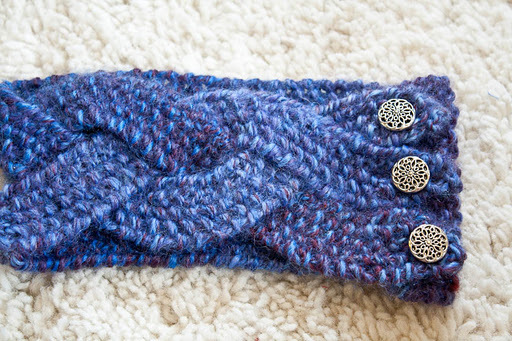 I would try knitting the body of the headband for about 9 inches and the braided part 9 inches so the headband measures about 17 inches when finished. I’ve not made one this size, but that’s the way I’d be inclined to try it. If you end up experimenting, I’d love to hear what you end up with! I’m using 2 skeins of worsted weight yard to have fun with 2 colors. Using size 10 needles the width of the headband (before it branches into 3 parts) is 7 inches. Is it going to be too wide in back? Should I take it all out and cast on less than 24 stitches? I love the way it looks in the photos. Don’t know how it looks in back. Thank you! 1. Knit the whole project with size 9 needles. It might be a bit snug to work with, but the width would be narrower. 2. Cast on 21 stitches and have your “legs” of the headband be 7 stitches instead of 8. I think the latter idea might work best. Thanks for your comment and I hope it works out! Thank you for your help. How wide is the back of the headband when you make it? I haven’t made one in a while, but I would say it’s about six inches. Thanks. With my yarn and my way of knitting, it looks like it would be 20-21 stitches. I’ll try your suggestion of 21 with 7 stitch legs. Thanks again! After I knit the first leg and pick up the next 8 stitches, do I just start knitting with loose yarn? Do I knot it??? 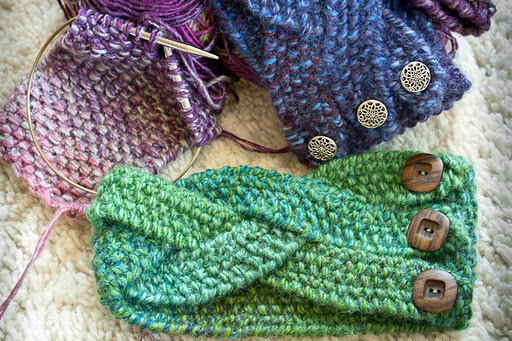 Yes, you start knitting with loose yarn. I don’t knot it until later but you could knit it loosely to keep in place. Good luck! Id like to make this but I am no good at knitting or using double pointed needles to bad this wasn’t crocheted. Yes, this is a pretty pattern. I’m actually working on designing a crocheted version. Hopefully I’ll be able to post a pattern this winter. Cute & great springtime headband! Thanks for sharing! ! My pleasure! Glad you like it.